Mamabelly's Lunches With Love: There is a Monster in my Lunch! Mondays are never easy in our house and it is hard to let go of the weekend fun and go back to school. A little fun is always appreciated when it comes to making Mondays a little cheerier. 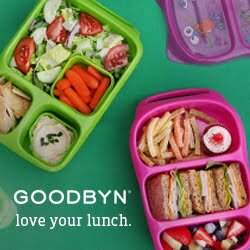 My friend Karen from What's In Our Lunch Bags recently sent us this adorable lunch system (thank you, Karen!) and today was perfect for a monster lunch! My first grader picked his monster and I filled it with apples and yellow peppers divided by wax paper, a cereal bar, half a cream cheese bagel and some organic popcorn and a left over brownie from yesterday. He also packed a yogurt and some ice water. Who wouldn't like to find a monster in their lunch? I love it! Anything to help my 2 and 4 year old eat! So cute! I've never seen these boxes before! Hey those monster lunchboxes look so cute! So adorable! Thanks for linking up to Meatless Monday!